The decoration of our house or apartment is kind a hallmark. This is a reflection of our style and rhythm of life, taste preferences and our view on comfort. Many owners of homes and apartments prefer to entrust the decoration of their homes to professionals who, in close contact with them will be able to create an interior that best meets all the requirements of comfort, aesthetics and functionality. But when you have free time and a desire to create a dream you can do it by your own. Just explore the latest trends and try to choose the design ideas that will most closely meet your needs and criteria of beauty, practicality and comfort. It is best to begin this difficult path of designing your own home with one room. For example, the interior of the bedroom is an important link in the chain of drawing up the design of an apartment or house. We spend a third of our lives sleeping. Good, comfortable and deep sleep affects our health, emotional state and activity level. All of us are waiting for luxury, comfort, atmosphere of maximum relaxation and calmness from the design of the bedroom. So what will be the most trending modern bedroom interior decoration & design ideas 2017? Let’s find out together. In the formation of modern design projects, experts are trying to find that difficult balance between cutting-edge design trends of residential spaces and that fashion ideas which be called – “at all times”. Not every design idea, which is now at the peak of popularity, is reflecting the specific needs of the customer; not every creative solution is applicable to everyday life. 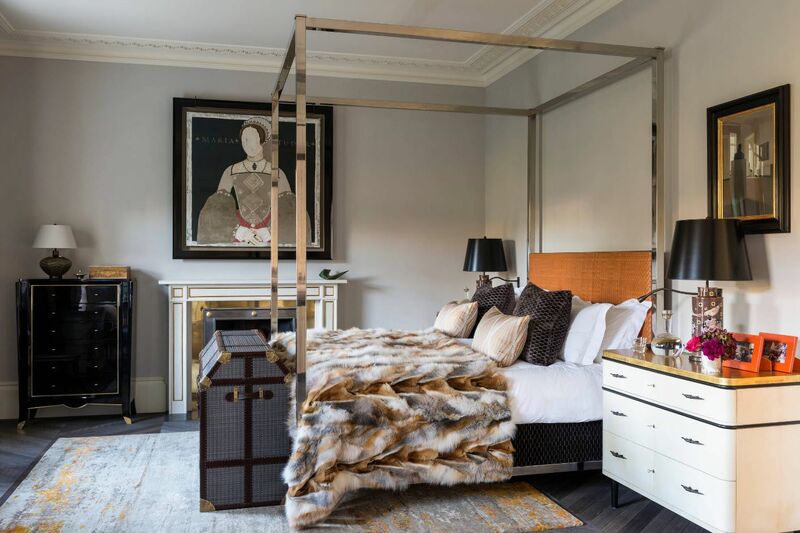 When choosing interior by himself, the owner of an apartment or private house will be in need to necessarily separate the “complicated” or impracticable design ideas in relation to his own stylistic and taste preferences. Modern style of decoration the dwellings is trapped between two stumbling blocks. On the one hand, actual design ideas are associated with minimalist trends, prompting us to get rid of all the excess, surrounding ourselves with only necessary interior items with maximum functionality. On the other, modern style advocated the creation of an atmosphere of maximum personal comfort. But many of us can’t do without basic items of furniture and decor to achieve a sense of comfortable and relaxed atmosphere. There is another aspect of creating a modern interior, which cannot be but affect its creation – it is multifunctionality of the rooms. The shortage of usable space for apartments or houses dictates uniting of functional segments within a small area on the premises. 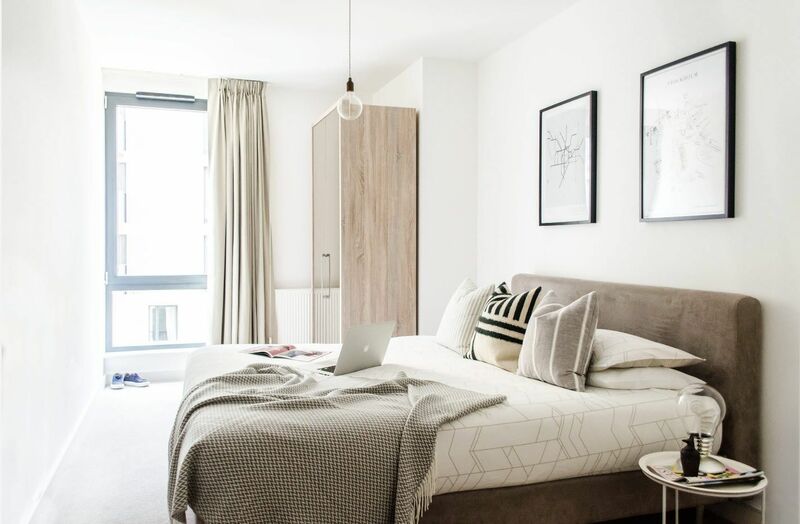 For example, modern bedroom is not just a place to sleep and rest, but also a dressing room, an office or a workshop, a library and a room for the baby. communication with the environment, highlighting of the natural interior motifs is transmitted through the use of natural materials and the use of natural colors in the color palette. 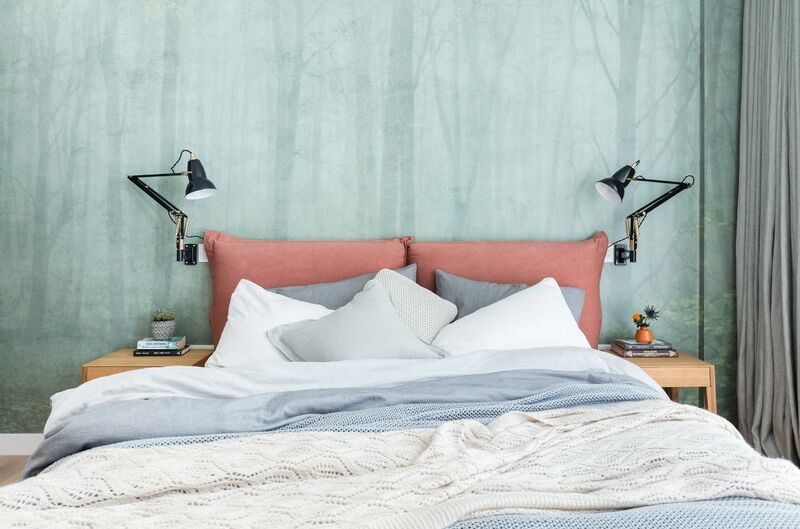 Choosing a color palette for the bedroom decoration and the entire interior design will depend on the size of the room and its position in relation to the sides of the world. If the room is located on the southern, south-eastern side of the building, it will be enough lit with the sunlight and you can use the colors from cold group. If the bathroom is located on the north side, it is better to prefer warm colors, so will be able to “raise the degree of” of interior color temperature. Experts recommend using no more than three colors in the design of living spaces. Wherein the light tone should be the main. 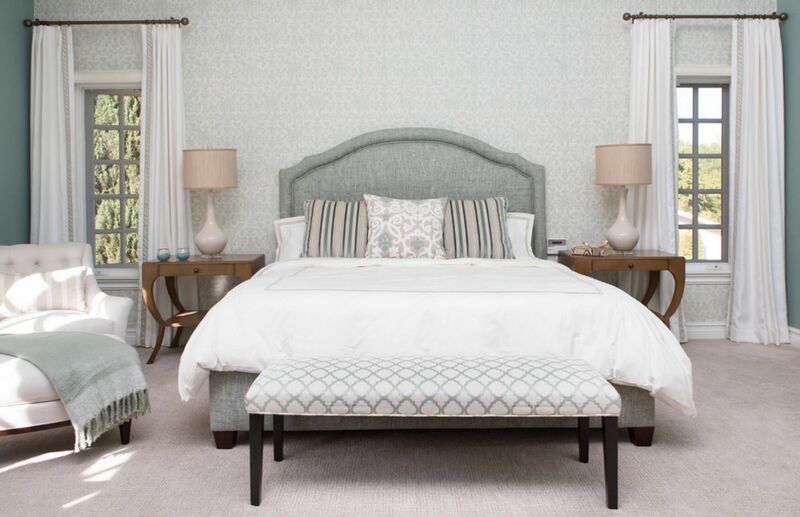 White and all its shades is the most popular color scheme for the registration of the bedrooms for many seasons. This is partly due to the fact that white color goes well with any other color solutions. It is able to visually increase the space and reflects natural light in it. The versatility of white shades allows to create original and at the same quiet image of the room even for those people who do it for the first time. White is associated with purity, serenity and ease. It is the very atmosphere that many of us have come to expect from the room where we have to rest and gather strength for new work, new achievements and victories. 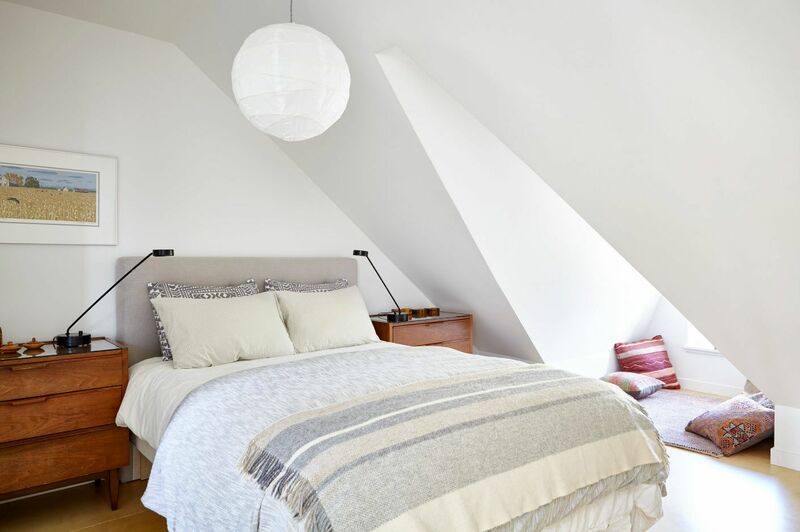 Use white as the main color and two more as accents and your room for sleep and rest would be not only easy for emotional perception, but also stylish and modern. White is the best fit to the concept of the modern style, which tends to the use of Scandinavian motifs. Nordic style is simple and concise, but also comfortable and cozy at the same time. It has a lot of light and space, there is a sense of freedom. And not minimalistic and cold but warm, homely. 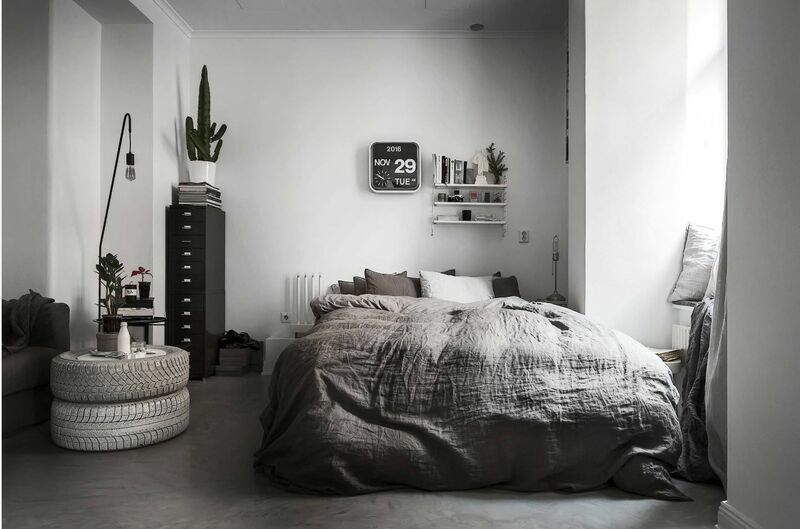 It is simple to create interior of the bedroom with the motives of the Scandinavian style, especially if you like to use white color as the background and place it on the contrasting elements of the interior in gray and wood tones. The simplest way of bringing the brightness into the room design in the Scandinavian style is using the textile – bed drape and carpeting. Even small blotches of color can transform a room, which is based on bright colors design. Large indoor plants located directly on the floor will help to bring freshness and closeness to nature. The use of brickwork in modern interiors has not lost its popularity. 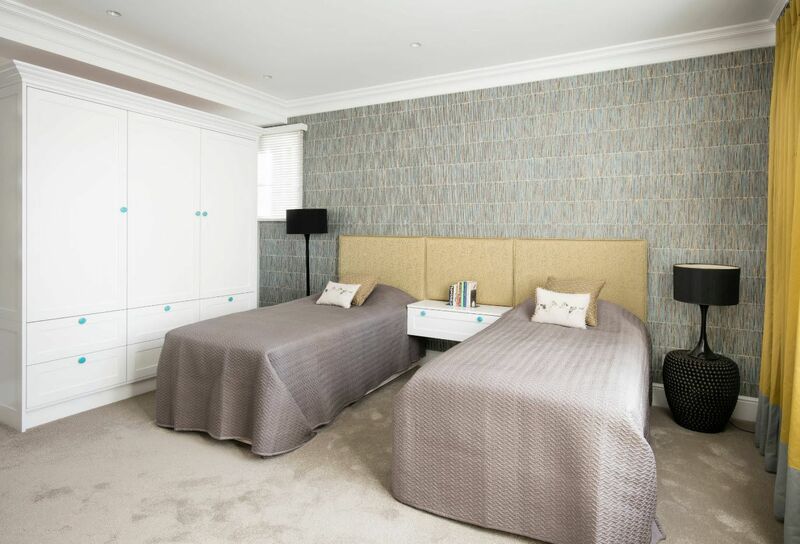 Even such a “distant” from the loft-style room as a bedroom can harmoniously take a textured finish. If the earthy colors of brick wall is too bold decision for you, so the light bricks treated with water-based paint would be an excellent backdrop for furniture and decoration even small-sized bedrooms. Combining the methods of finishing is one of mainstreams of living spaces design in the current season and the future. The ceiling design is more or less predictable – often we just need to achieve a perfectly flat snow-white surface. For the finishing of floors, experts recommend to use the classic floorboard. Natural material will ensure environmental safety and attractive aesthetics. But we can make interesting experiments with the design of the walls. 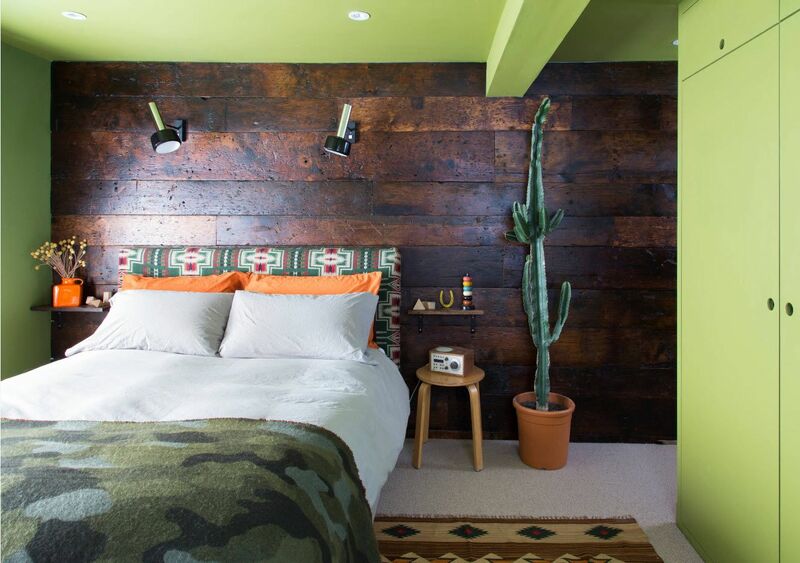 Design technique called “accent wall” has become popular for bedroom interior as never before. 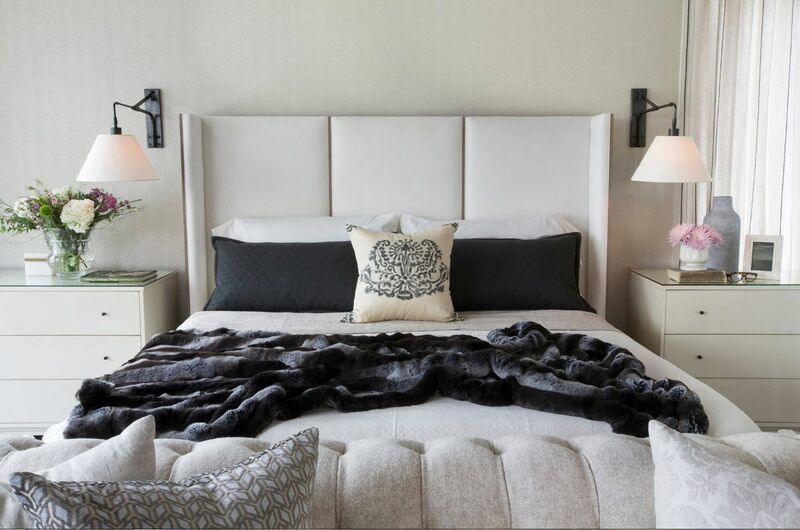 Surface behind the headboard “becomes” accent wall most often. It is possible to highlight it by means of the original wallpaper with photoprint, wall plates (made of wood, acrylic, ceramic or even glass), fabric, plaster or liquid wallpaper. 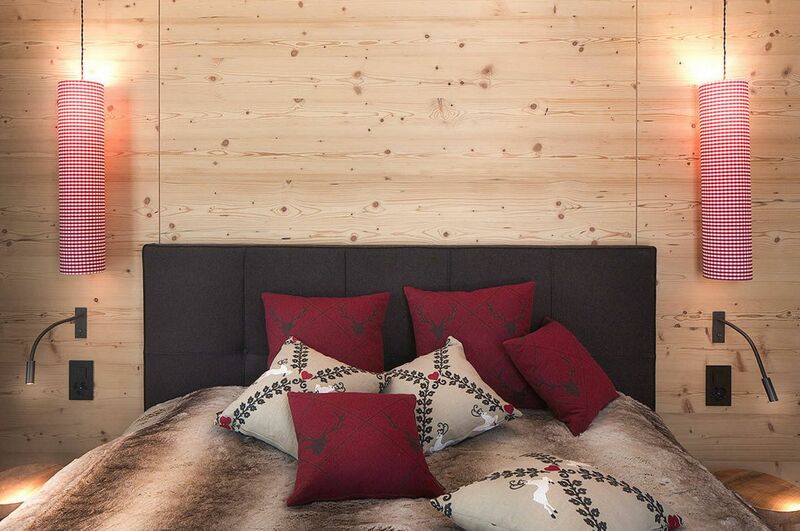 Wall panels made of wood and MDF are very popular. There is no other thing that brings a natural warmth in the room design as a unique pattern of wood. If your bedroom has a fireplace (no matter it is real or only the imitation), then the space around it just needs finishing of “natural stone” looking material. Modern masonry imitation look no worse than a natural material, but are also easy to install, weigh much less and less capricious in care. 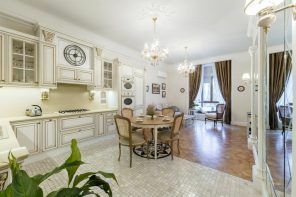 Even a small piece of the surface decorated with the help of artificial stone will bring the mood of country house luxury, even in the framework of a city apartment. Wallpaper with metal embossing, velor, velvet, viscose and other textile finishing materials are literally created for the dormitories. Luxury fabrics can not only blends into the sleek design of the room, but bring elegance, sophistication and a touch comfortable atmosphere to its image. No one will argue the fact that the bed is a key element in the bedroom. Sleeper is not only convenient and comfortable area for recreation, but also the coordination center of the interior around which often the whole concept of design builds up. Even modern style which is tending to minimalism accepts not just attractive aesthetics but luxury in the design of the bed. 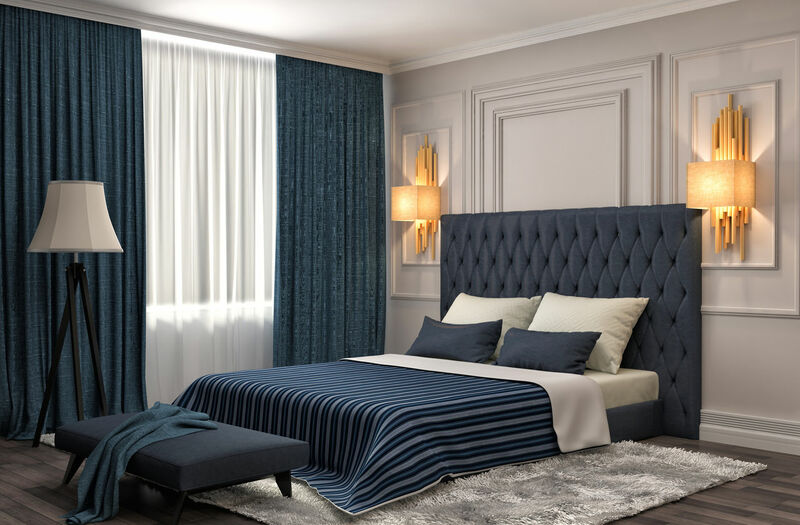 Expensive headboard velor upholstery, decorative elements with glossy surfaces or luxury textile design – all these trappings do not exclude orthopedics and ergonomics of the product and a mattress for him. Most often, the design in the room is not limited to sleeping place only. 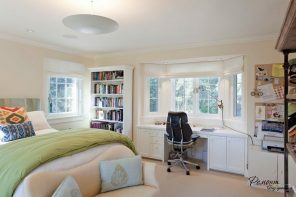 Setting up your work space in the bedroom is determined by relaxed atmosphere. It is often impossible to concentrate and immerse yourself into the work in the living room, where the whole family gathered. In addition, ​​the desktop can play the role of the dressing table as part of the sleeping area, just having undergone a minor metamorphosis. If you want to equipped not just a working place, but the whole home library in the bedroom, you wouldn’t manage it without the book shelf. Designers recommend to give preference to open shelves rather than bulky bookcases with glass inserts on the doors. Even if the wall of books will be floor-to-ceiling height, the structure will not look massive if it is executed in white (or the lightest type of wood). Of course, there is a definite disadvantage of using rack, shelves of which start from the ceiling, because you’ll be in need of a stepladder or ladder. But this problem can be solved with the help of a lightweight, but strong at the same time ladder which is easy to find in the chain stores of household goods. You can use all the space around the window opening for the bookshelf. Most often, these surfaces are not used at all. Even small artificial niches can accommodate several rows of open shelves, which will become a spacious storage system for books, documents and home office. As for decorating windows with curtains and drapes, the modern style tends to the complete absence of any textile or the use of thin, translucent tulle. It is easy to apply this rule for the living room, allowing sunlight to freely spread around the room, but the presence of blackout curtains in the bedroom is most often not a decorative element but a necessity. Designers recommend the use of fabric blinds or Roman blinds for rooms in which there is a need to hide the situation from prying eyes and sunlight. 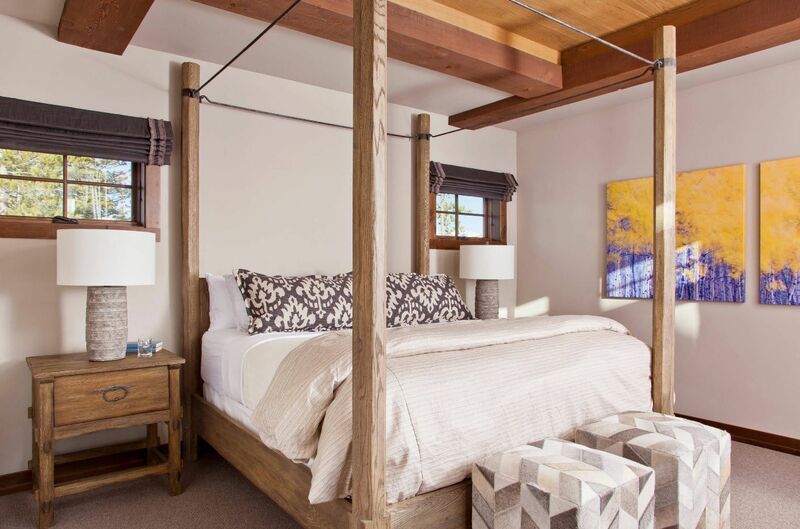 If the room that it was decided to be a bedroom is not distinct with a large area, then some of the standard design techniques for the design of the space just will not fit it. First of all, you must get rid of everything unnecessary. A small space can become messy very quickly if you’re not consistently keeping track of the emergence of “necessary” interior pieces and sifting them. Only the most important pieces of furniture should be left in the small bedroom. They are bed and storage system (in some cases, we’ll have to give up even the cabinet or chest). Use bright and warm colors for the decoration of the small room for sleep and rest. Mirror and glossy surfaces will help to visually enlarge the space. Stretch glossy ceiling visually increase the height of the room. 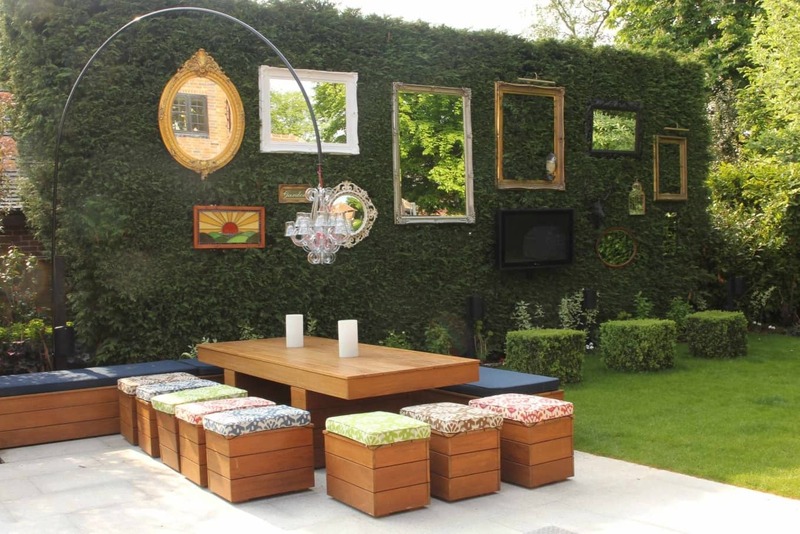 And the mirrors as partial wall finishing or wall decoration will help to erase the boundaries of a small space. But this does not mean that small bedroom does not have place brightness. On the bright background of the walls contrast will look not even the brightest shades. 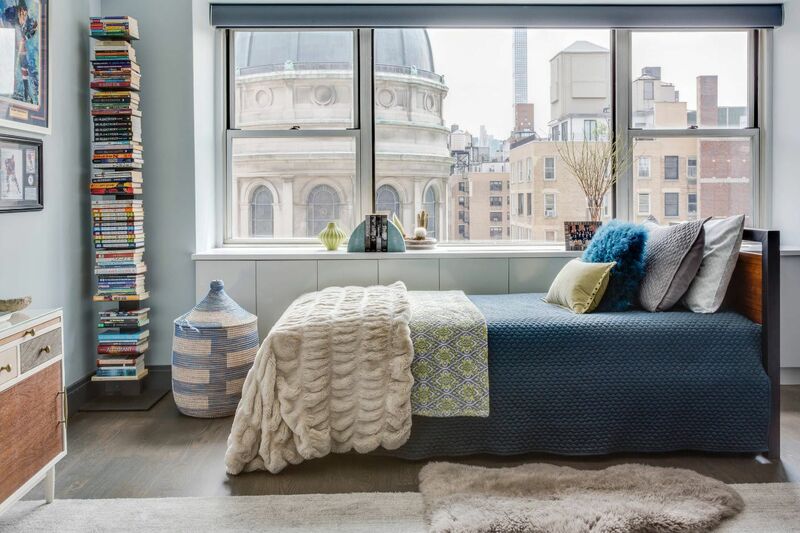 Use textile bed design as an accent (bedspread and “runner”, decorative pillows, bed linen) – it can always be changed, if the coloring is bothering. The lighting system requires special attention in small rooms. Since properly selected and arranged light sources can perform a miracle in a space. They can visually increase the room, create a truly warm and welcoming atmosphere. A small area of ​​the bedroom is not a reason to confine yourself with only the central chandelier. It is better to be able to maneuver – lightings for bedtime reading or for creating a special, intimate atmosphere.